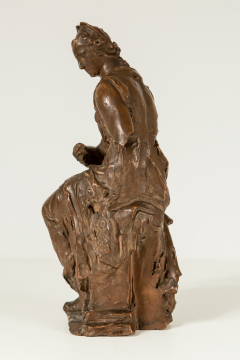 A small draped, seated female figure, the model for the full-size figure of 'Architecture' on Michelangelo's tomb in the Church of Santa Croce, Florence, c.1564. 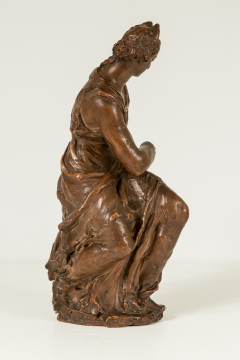 You are here: CollectionsOnline / A small draped, seated female figure, the model for the full-size figure of 'Architecture' on Michelangelo's tomb in the Church of Santa Croce, Florence, c.1564. The tomb was planned by Vincenzo Borghini and designed by Giorgio Vasari in 1564, shortly after Michelangelo's death. Each of the three figures representing Sculpture, Architecture and Painting, was assigned to a different artist. 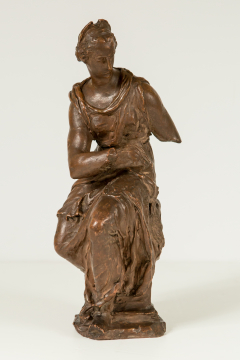 The identification of this piece as a model for the allegorical figure of 'architecture' from the right-hand side of the tomb was not known to Sir John Soane and in the earliest Museum inventories (1837) it was described simply as 'Small model of a sitting female figure (with hands broken off). Terracotta'. 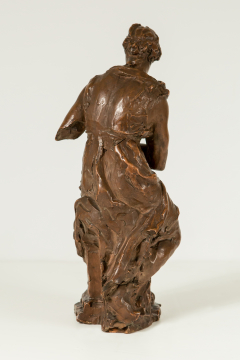 A sketch model by Battista Lorenzi for the figure on the left-hand side of the tomb, originally of 'Sculpture' but then changed to represent 'Painting', is in the Victoria and Albert Museum (V&A inv. no. 4121-1854).